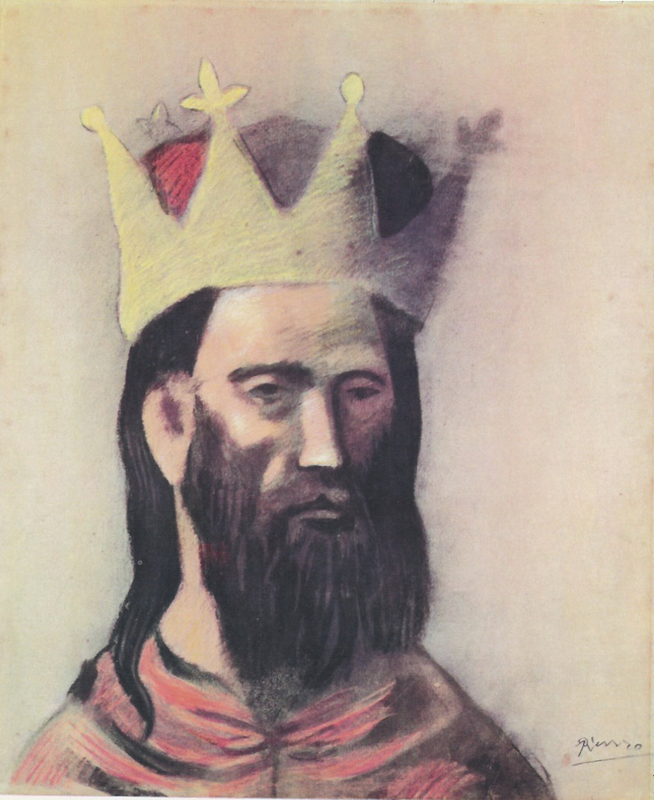 Picasso's early pastel of a king during his Rose period looks like...... a king? An anonymous sovreign at that. There must be more meaning. 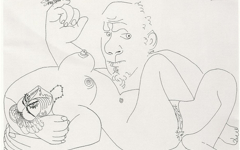 Others note that he derives from the artist's long series of impoverished acrobats and jugglers, all of whom are self-representations of Picasso1. Yet why would he suddenly veer away from depicting the poor to portraying the powerful? Even early critics noticed a resemblance between the monarch's crown and a jester's triangular-peaked cap, both created in Spring 1905. Is the king, though, like the jester an alter ego? Knowing as we do that he must be, we need to keep on looking. Try not to give up. 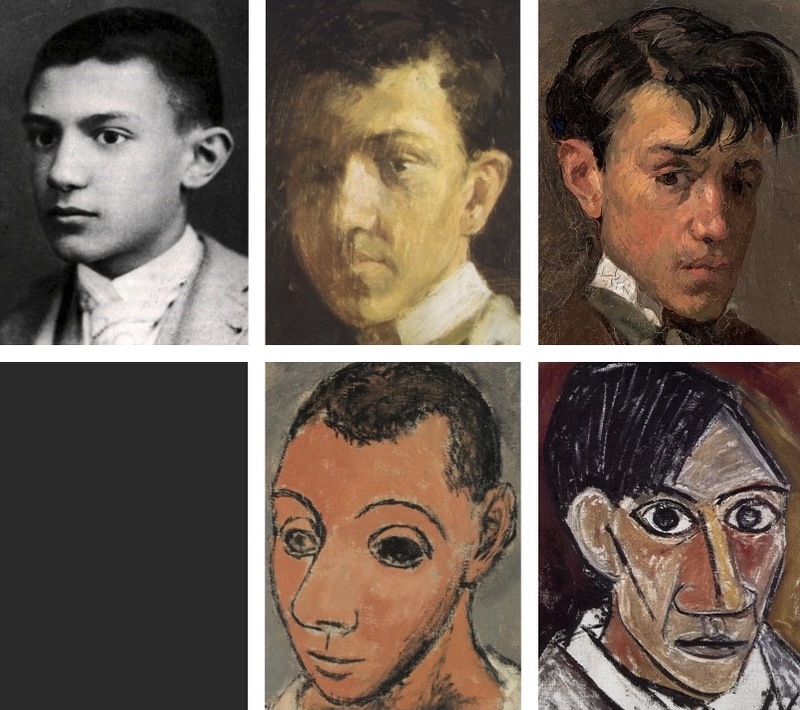 Picasso had big ears and used them as a self-identifying mark on unrelated faces, just as Michelangelo used his broken nose for the same purpose and Degas his sloping one.2 In a photo and a range of self-portraits between 1898 and 1907 Picasso's lug-hole is prominently displayed (left). 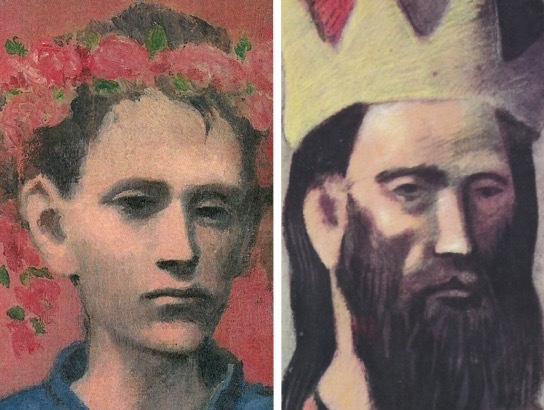 Even in the well-known Boy with a Pipe from the same year (left) the youth's ear is overly large as the king's is too. 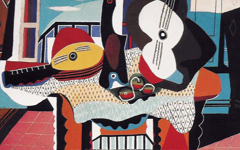 Also, as shown elsewhere, the adolescent's clothes are similar to Picasso's in the studio.3 Despite the age gap between him and the bearded monarch, their facial features are similar including the lines of hair on either side of their foreheads. Besides both are honored: one wears a coronet, the other a garland of roses like that of laurel. In a related drawing, now in Moscow, another king has a more elaborate crown with an inner helmet decorated like a sky at night. Around this cosmic background, pairs of titanic figures struggle to hold up heavy objects. Far too fanciful for a real coronet, these are thoughts inside the king's mind, a representation of the creative struggle Picasso himself would undergo to create an artwork of universal import. However, the king inside Picasso is inside us all. Now look at the beards of the two men. 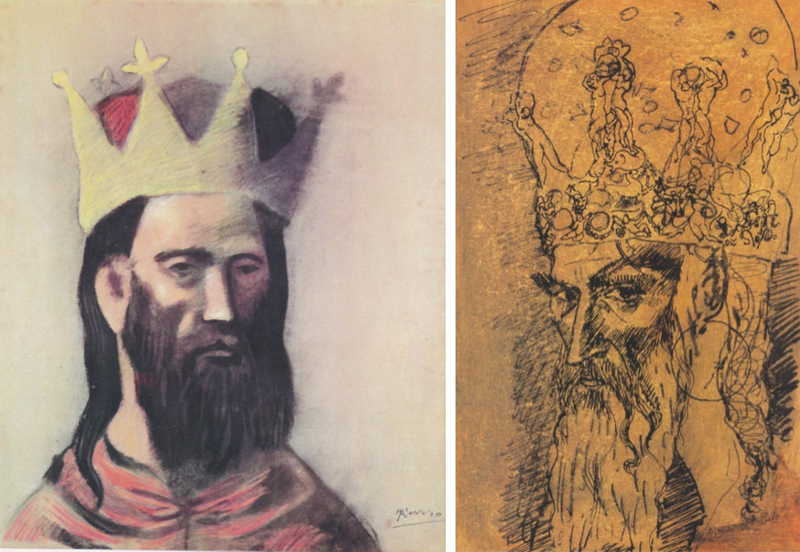 That of the king in the pastel (above left) resembles the head of a flat paintbrush with a few hairs hanging down towards the edge of the frame from its left corner; the other king's (above right) is cut off in the same way by the edge of the frame itself. 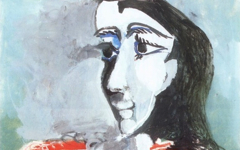 The edge of the image is a traditional and widely-used location in art for the metaphoric presence of the artist's hand.4 In combining a royal head with a paintbrush-beard, Picasso combines craft, intellect and a universal symbol of power and perfection into one memorable image. And like the method just explained, the metaphoric presence of two eyes near the lower edge is also commonly used to suggest that what appears above those "eyes", which are the artist's, takes place inside his head. Here the "eyes" are suggested by a short black line on the left-hand side and the hint of a circular black form on the right-hand side. The former represents a closed eye for insight; the latter an open eye for observation of nature. For more on this theme, see Eyes at Bottom. 2. See "Ssh! 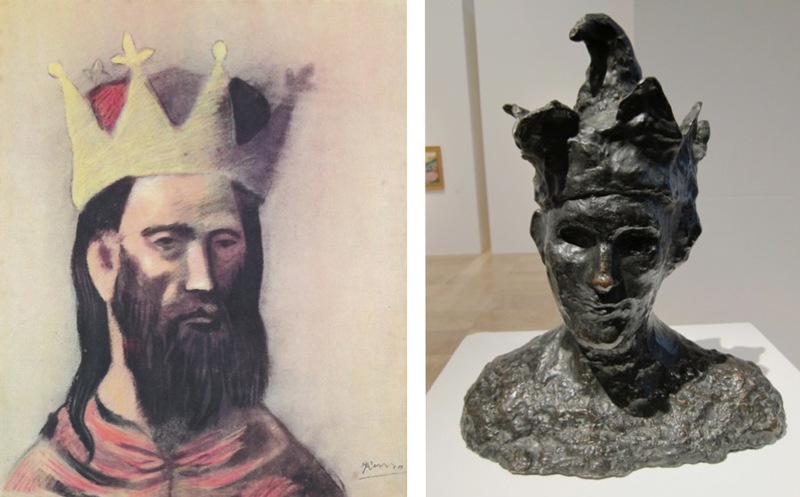 The Secret of Picasso's Big Ear" (2015), "Picasso's Head of a Picador with Broken Nose" (2011) and Degas' Portrait of Manet (c.1865). 3. The painting is explained in Picasso's Boy with a Pipe (1905). 4. This method of indicating the painter's active presence in the painting has been used at least since the Middle Ages as seen in numerous examples on EPPH. For an overview, see "Pointing at the Edge" (2012). Original Publication Date on EPPH: 12 May 2016. © Simon Abrahams. Articles on this site are the copyright of Simon Abrahams. To use copyrighted material in print or other media for purposes beyond 'fair use', you must obtain permission from the copyright owner. Websites may link to this page without permission (please do) but may not reproduce the material on their own site without crediting Simon Abrahams and EPPH.